Yellow insert. Duncan's plastic yo-yo with a reslon-coated metal axle, in the same body shape as the Duncan Professional. 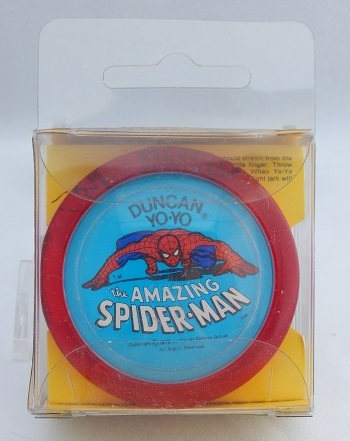 The static image on one side says, at top, "Duncan Yo-Yo"; bottom portion says, "The Amazing Spider-Man". Compare with version 1. The profile of this yo-yo is identical to the Duncan Professional. The Duncan Magic Motion series of Super-Hero yo-yos--7 total--came out in 1980. In 1978, "Superman" the movie was released, "The Incredible Hulk" series began airing on TV, "Wonder Woman" was in its third TV season, and "The New Adventures of Batman" animated TV series began in September, 1977 and ended mid 1978, lasting only one season. The counter display included Superman (8), Hulk (8), Wonder Woman (6), Spiderman (8), and Batman (6). Each yo-yo came packaged in clear plastic boxes with a hang tab and printed insert. The Magic Motion animation on one side of the yo-yo was created by Optigraphics Corporation. When you tilted the yo-yo, the character image changed to an alternate image. The opposite side of the yo-yo held a static image of the character, in this case, the Amazing Spiderman. The Magic Motion pictures on this edition are identical to the Magic Motion pictures on the Spiderman, version 1 edition. The metal axle on Duncan Magic Motion yo-yos were Reslon coated. Some people refer to the coating as Teflon, but that is incorrect. Reslon was Duncan's own thermal bonded fluorocarbon resin coating that reduced friction between the axle and string, and allowed up to 20% longer spin times. Reslon axles were also used on Duncan Imperials in the early 1980s. The Reslon trademark, owned by Flambeau, was officially registered August 28, 1979. On December 15, 2000 the trademark was cancelled. Original, unopened boxes of this model of yo-yo still have the very long single piece of tape that sealed down both sides of the box top flap, and the bottom.